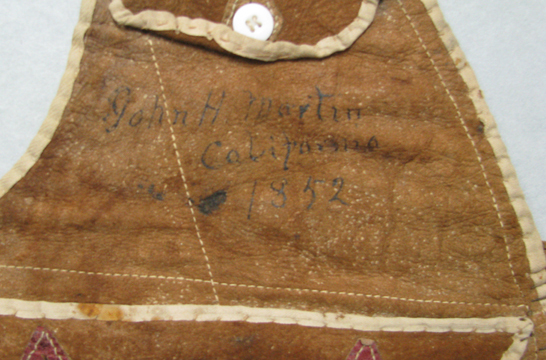 The owner's name is handwritten on the right chest, "John H. Martin, California 1852". 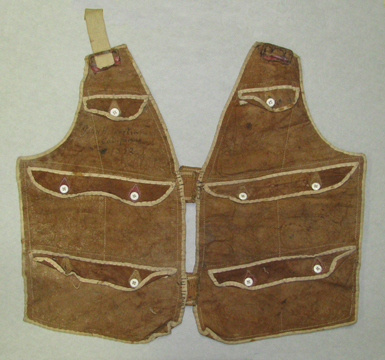 This money vest is one of many historical articles of clothing stored in the textile vault at the Wayne County Historical Society. This handsome money vest was worn by John H. Martin during the California Gold Rush. It would have been worn under his clothes. The vest has a secret pocket for cash and coin. There are visible coin marks. This vest was donated to the Wayne County Historical Society in 2002 by Duane Martin, son of Willis Martin of Fredericksburg, Ohio. I just found a very similar vest from the California Gold Rush and was searching the net for information when I came across this site. Thanks! Very helpful information.